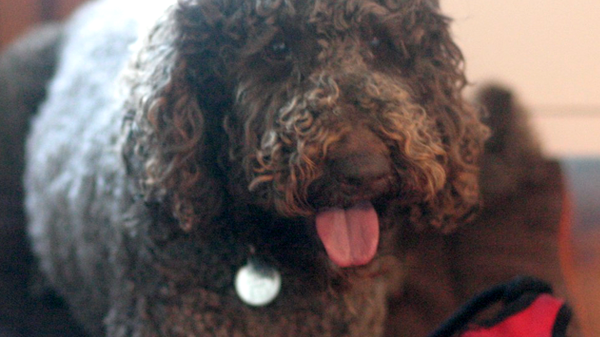 My gorgeous sidekick Pluto (a perennial puppy) is TEN now. And I never saw it coming. I never imagined her slowing down. She was always the first to get to any ball bouncing or frisbee tossed. About 3 years ago something changed. Pluto kept playing as hard as ever. But one day she started limping afterwards. The next time she played it happened again! We brought her straight to the vet and were advised that Pluto had arthritis and a possible cruciate ligament issue. Cruciate surgery was recommended as a possible solution. There was no absolute proof of a cruciate issue so we waited. Pluto did a six week course of Cartrophen ( prescription only, injectable, sulphated sugar of plant origin used to treat arthritis) at our vet. I reckon this definitely helped short term, but it wasn’t until we put Pluto on increased arthritis supplements for a few months that we noticed remarkable changes. Her pain decreased rapidly. Her mobility increased. She was able to play again. We didn’t push her to the limit. We kept it reasonable. And Pluto was DELIGHTED to reconnect with her beloved sports. I tell you I wouldn’t have believed it if I hadn’t seen it. The green lipped mussel in the PAW Osteocare was helping but when we punched it up with the Vitamin C in the Rosehip Vital we saw amazing impact. We’ve kept her on this formula for a few years now. Pluto is doing great! She doesn’t have to be first to the ball any more but she is still playful and frisky as a pup. When you see those signs there’s a good chance arthritis is involved. But be sure to go to your vet for a diagnosis though to confirm you are on the right track in case there is something else you need to know. If arthritis is the culprit don’t wait! 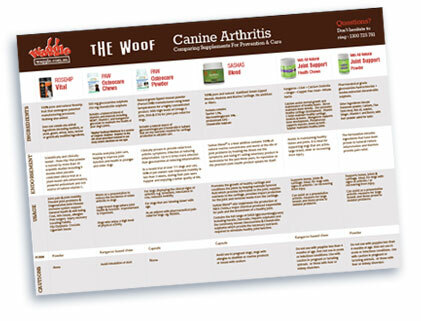 Get your dog on some arthritis supplements if you aren’t supplementing already. And personally, I would be supplementing even before. To save you from analysis paralysis I’ve put together a comparison of the top arthritis supplements on the market so you can make a choice with clear information. I’m not a vet. I’m just a consumer like you. I’ve made this comparision just with the information provided by the product manufacturers and it’s certainly helped me to see details of each product side by side. I hope it will help you too. Download my comparison table to seel detailed differences between your Arthritis Supplement options. I’ll give you a quick run down of my findings below and you can decide for yourself which you’d prefer to try with your dog. These supplements should work within 3-4 weeks. If you don’t see improvements within a month or two you might want to change options to see if another works better for your dog. 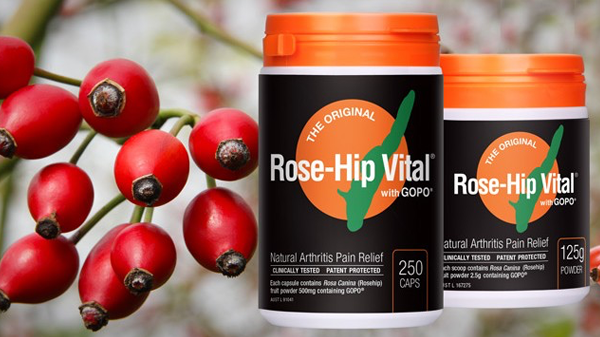 The two ingredients which stood out to me in my research for arthritis care are GAGS (glycosaminoglycans) which help build & repair joints and Vitamin C for it’s work as a powerful anti-inflammatory. All but one of the options below focus on one of these two approaches. I am a firm believer in this supplement. Pure Vitamin C. I like that it contains no animal ingredients. I like that it has no contraindications. And I really think it worked for Pluto in a serious way. These chews are a preventative supplement to keep joints healthy before signs of arthritis are visible. They are easy to administer in a kangaroo based chew. 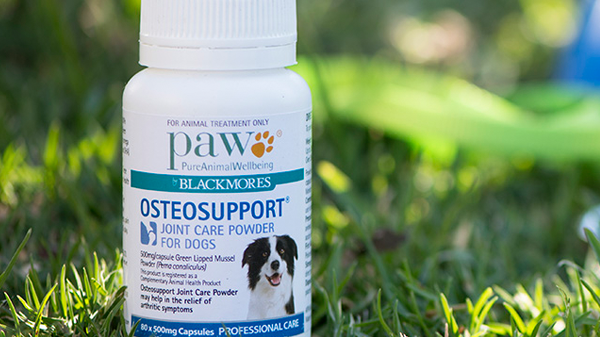 This is PAW’s higher concentrated option for older dogs & those with clear arthritic symptoms. 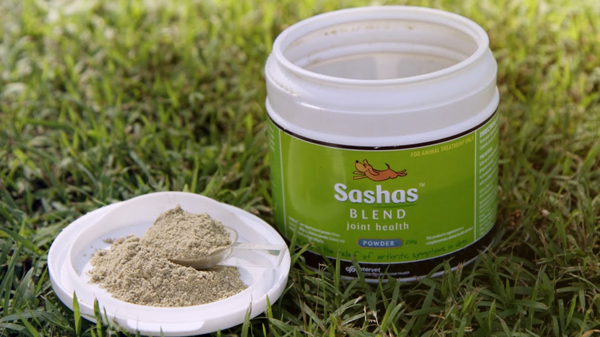 I haven’t tried Sasha’s Blend only because I saw such great results from Rosehip Vital & PAW’s Osteocare Powder. Once you’ve got something that’s working well you don’t want to mess with it. 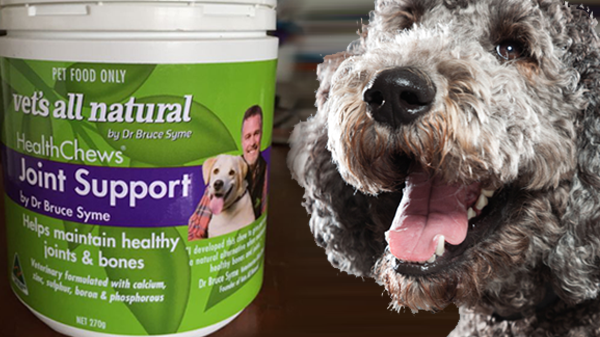 Sasha’s states it’s the #1 selling veterinary product in Australasia. + 100% pure Green Lipped Mussel, Abalone and Marine Cartilage. 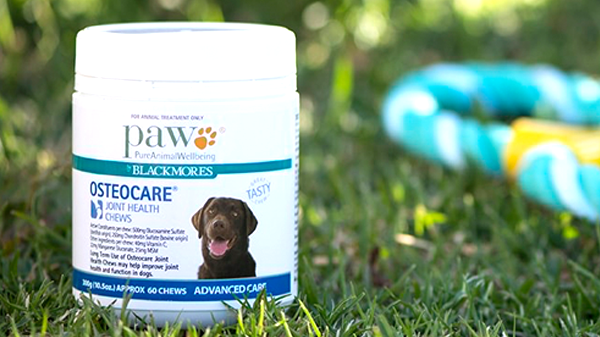 This is another preventative care chew including a range of helpful vitamins & minerals which supports dogs who are active, older, larger breed or recovering from injury. 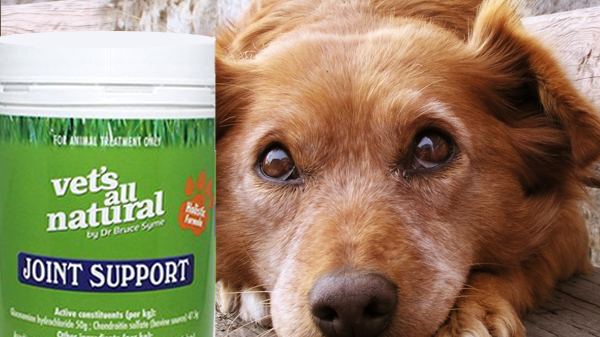 Here’s Vets All Natural’s powder option for dogs either prone to or suffering with arthritis. + Arthritis preventative for large breeds & those prone to skeletal problems. – Do not use at less than 4 months of age, in acute or infectious conditions. Confused about your options? Just give me a ring and I’ll do my best to steer you right. There is so much more I’d like to say about Canine Arthritis. And I’m going to do it! I’ll take you through some other important ways you can reduce the imact of arthritis on your dog. I covered supplements first because from my experience it’s important to waste NO time in getting those babies going. 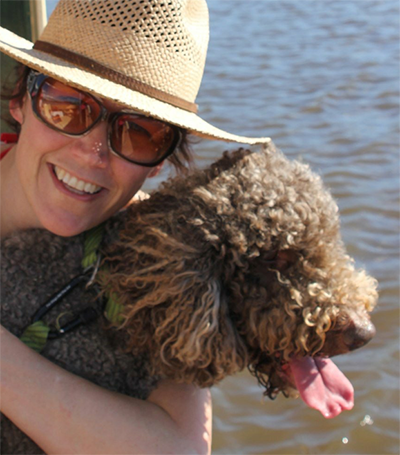 March 22, 2017 | Filed under Canine Health, Uncategorized. My old lab had arthritis for many years. We tried many of these products, with good relief from symptoms for a time. Eventually the vet put me on to 4cyte. It contains the green lipped mussel extract some of the others do, marine cartilage, abalone and also a plant based oil. It appears to have some good evidence behind it (including a study right here in Australia), and certainly provided some relief for my boy. Might be worth considering if you have a dog who’s no longer getting enough relief from other supplements. Can also be used with anti-inflammatories. Thanks so much for your feedback Katherine. I’ll definitely have a look into the 4cyte. We’ve had great success with the Canine Vital + PAW Osteosupport so we haven’t looked further yet, but I’d definitely want to have anything on hand that can help other dogs. Have a most waggly weekend! Zoe, if you feel Pluto needs something more to help over time, do try the Pentosan/Cartrofen/Zydax injections again. My very old girl has been on arthritis drugs & supplements for over 10 years, and for the last year or two has been getting the Zydax shots once a month. She used to get the series of 4 shots over 4 weeks a few times a year for the previous 10 years. The monthly shots are fabulous, combined with various vet meds and supplements, and chiro visits every 2 months. Thanks Phoebe for your input! I’ll keep that in mind for the future. Pluto seems to be going really well on just the 2 supplements so I think I’ll stick with that for now. Injections are a bit more intrusive so I’ll hold off unless needed. We bring Pluto to the chiro as well too. All the best to your girl there! I’d need more info before choosing a supplement. As an animal scientist, the words “high in ingredient x” mean nothing. In order to effectively decide, I would need a breakdown of the amount of each ingredient in g/kg or their percentage inclusion. Many of the joint and arthritis supplements require intensive digging to find the actual inclusion rates of the active ingredients (some of which are so low as to be laughable). This gives you the info to compare how much active ingredient is being supplied to your dog at what cost per day. Do this with all supplements, and you can compare them on an equal footing. Apples with apples, as it were.